Extreme ultraviolet lithography (EUVL) is an advanced microchip manufacturing technology that uses a single mask instead of multiple masks. Extreme ultraviolet lithography uses a light source of extremely short wavelength i.e. around 13.5 nm. EUVL is a highly precise technology that manufactures microchips supporting 10 GHz of clock speed. EUVL functions when high-flaming energetic beams of ultraviolet light get reflected from a circuit design pattern onto a silicon wafer. This light should get reflected from mirrors, instead of refracting through lenses, onto the wafer. EUVL exhibits different properties at different wavelengths. For example, a typical industrial application of EUVL requires high-power ultraviolet light source of wavelength of 13.5 nm and throughput of 100 wafers per hour. Rising adoption of miniaturization of electronic circuit devices is expected to drive the global extreme ultraviolet lithography market during the forecast period. The global market is anticipated to reach value of US$ 3,807 Mn by 2026 from US$ 458.3 Mn in 2017, expanding at a CAGR of 26.8% during the forecast period. The global extreme ultraviolet lithography market has been broadly segmented in terms of light source, end-use, and region. Based on light source, the market has been divided into laser-produced plasma, gas discharge, and vacuum sparks. Based on end-use, the market has been classified into memory, foundry, and integrated device manufacturers (IDMs). In terms of region, the global extreme ultraviolet lithography market has been segmented into North America, Europe, Asia Pacific, Middle East & Africa, and South America. Among light sources, the laser-produced plasma segment holds a major share of the global extreme ultraviolet lithography market and it is expected to maintain its dominance throughout the forecast period. Advancements in miniaturization and sophistication of electronic devices are driving the market. However, the market faces challenges, due to high costs of extreme ultraviolet lithography equipment. These high costs are attributable to advanced, complex, and unique feature of the equipment in terms of using extremely short wavelengths. Increasing use of extreme ultraviolet lithography in the semiconductor industry and less number of masking layers compared to the argon fluoride immersion technology are expected to provide significant opportunities to the global extreme ultraviolet lithography market in the near future. Considering rapid growth of the market, several players are investing in the global extreme ultraviolet lithography market. In October 2018, Samsung Electronics started wafer manufacture of its product i.e. 7-nanometer LPP (Low Power Plus) with the help of extreme ultraviolet (EUV) lithography. One of the major players in the global extreme ultraviolet lithography market is ASML Holding. As of now, it is the only major manufacturer of extreme ultraviolet lithography. However, several other companies such as Intel Corporation, Samsung Electronics Co., Ltd., Taiwan Semiconductor Manufacturing Company Limited (TSMC), Canon, Inc., Nikon Corporation, and Carl Zeiss AG are expected to be among major players in the global extreme ultraviolet lithography market in the next few years. 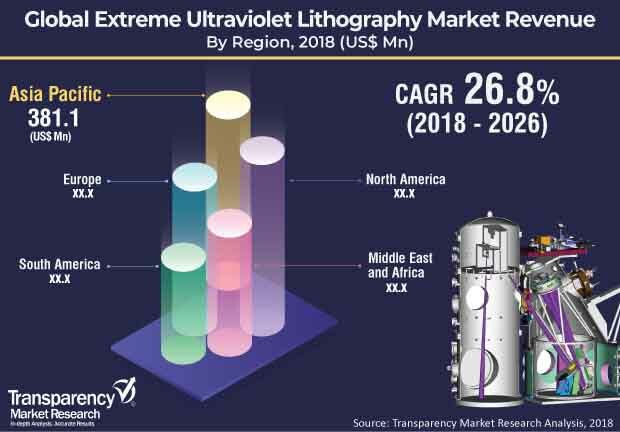 This comprehensive report by Transparency Market Research analyzes and forecasts the extreme ultraviolet lithography (EUVL) market at the global and regional levels. The report provides analysis of the market for the period from 2016 to 2026, wherein 2018–2026 is the forecast period and 2017 is the base year. A comprehensive and unbiased market assessment has been made to provide readers with in-depth and accurate analysis. The report emphasizes all major trends anticipated to be witnessed by the market from 2018 to 2026. It also focuses on market drivers, restraining factors, and opportunities for the global extreme ultraviolet lithography market. The study provides a complete perspective on growth of the extreme ultraviolet lithography market, in terms of value (US$ Mn), across various geographies including North America, Europe, Asia Pacific, Middle East & Africa, and South America. The report includes detailed value chain analysis, which provides an extensive view of the global extreme ultraviolet lithography market. Porter’s five forces analysis has also been provided to help understand the competition scenario of the market. The study incorporates market attractiveness analysis, wherein light source and end-use segments have been benchmarked based on their market size, growth rate, and attractiveness. In order to offer complete analysis of the competition scenario in the market, attractiveness analysis of the market in every region has been provided in the report. The market overview chapter in the report explains market trends and dynamics that include drivers, restraining factors, and the current and future opportunities for the global extreme ultraviolet lithography market. Market outlook analysis has also been provided in the report. Additionally, the report provides analysis of different business strategies adopted by leading players operating in the global market. The market introduction chapter helps in getting an idea of different trends prevalent in the global extreme ultraviolet lithography market. The extreme ultraviolet lithography market in North America has been further segmented into the U.S. and Rest of North America. Furthermore, the market in Europe has been segmented into Germany, the U.K., France, and Rest of Europe. The market in Asia Pacific has been classified into China, Japan, South Korea, Taiwan, and Rest of Asia Pacific. Middle East & Africa comprises GCC, South Africa, and Rest of Middle East & Africa. Similarly, South America includes Brazil and Rest of South America. The report provides all strategic information required to help understand the global extreme ultraviolet lithography market along with insights into market segments according to geographical regions mentioned above. The research methodology is a perfect combination of primary research and secondary research. Secondary research sources include annual reports, company websites, SEC filings and investor presentations, national government documents, internal and external proprietary databases, statistical databases, relevant patent and regulatory databases, market reports, government publications, World Bank database, and market-specific white papers. Primary research involves telephonic interviews, e-mail interactions, and face-to-face interviews for detailed and unbiased reviews of the extreme ultraviolet lithography market across geographies. Primary interviews are usually conducted on an ongoing basis with market experts and participants in order to obtain the latest market insights and validate the existing data and analysis. Primary interviews offer new information on important factors such as market trends, market size, competition landscape, and growth trends. These factors help validate and strengthen secondary research findings. Moreover, the data collected from secondary and primary research is discussed and examined by TMR’s expert panel. The research study includes profiles of leading companies operating in the global extreme ultraviolet lithography market. Market players have been profiled in terms of attributes such as company overview, financial overview, business strategies, and recent developments. Parameters such as investments and R&D activities by major players have been tracked. Currently, only one player i.e. ASML Holding N.V. operates in the global EUVL market. However, in the next few years, other players such as Intel Corporation, Samsung Electronics Co., Ltd., Taiwan Semiconductor Manufacturing Company Limited (TSMC), Canon, Inc., Nikon Corporation, and Carl Zeiss AG are likely to invest in the market. The report profiles these players and takes into account key strategies adopted by them.